ICanToo - 100% Cotton Short Sleeve Solid Color V Neck in 8 delicious colors. MADE IN USA . Cool, smooth-knit Combed Cotton Short Sleeve T's with V-Neck in solid colors. If you are one who prefers a solid color Tee with NO design, you'll love these! Compliment your summer attire with a couple of these adorable tees to wear with your shorts or capris. They feel great from the moment you put them on and keep that good feel and original shape/size wash after wash after wash. In cool, Combed Cotton which are looser-fitting than Rib-Knit. In SOLID COLORS: Sky, Salmon, Peri, Lemon Drop, Kiwi, Sunset, Black and White. Generous Sizes S, M, L, XL & 2X. Falls to mid-hip. The "Jersey Story": "COMBED COTTON Jersey" lays flatter with a more of a free-flowing drape; whereas "RIB KNIT Jersey" tends to follow your body shape a little more, but still no-cling. 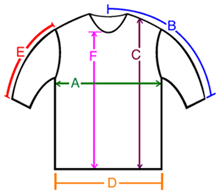 A: Chest / Bust circumference 37-38" 39-40" 40-41" 41-42" 45-46"
B: Sleeve length from center of neck to end of sleeve 15.5" 16" 17" 17" 18"
C: Body length from shoulder to bottom of hem 23" 23" 24" 25" 25.5"
D: Hem circumference 37" 39" 42" 43" 47"
E: Sleeve length from shoulder to end of sleeve 7.5" 7.5" 8" 8" 8"
F: From the bottom of the V-Neck to hem 18.5" 19" 19.5" 20" 19.5"
Just received this t-shirt & the ICanToo Zip-front Sweatshirt...love them, so ordered them again in other colors. Several years ago, I first found ICanToo t-shirts while vacationing in Sanibel Is., FL....after searching the internet, found them here on your website!